Pianos, like most things, suffer deterioration over time. 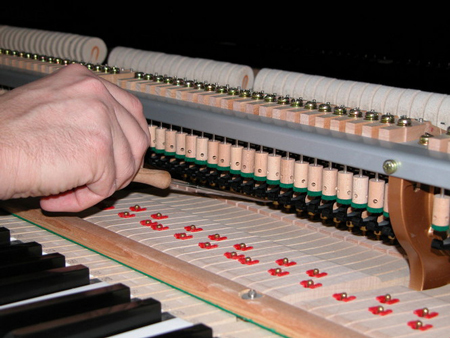 The piano action has over 8000 moving parts and fulfils the same role in a piano as an engine does in a car. The action is made from wood, metal, felts and leather. These sometimes need replacing/ repairing to allow the piano to continue to work. Periodic adjustments are made, in the same way you would send a car for it’s MOT. This work is called piano regulation and ensures the piano is ‘running at its best’, so that the instrumentalist is not distracted by sticky keys, squeaky pedals or other anomalous noises; and is not affect by an uneven, unresponsive feel. Piano regulation is important in order to acheive and maintain a consistent sound and feel across all of the notes.